This tutorial will review the process of managing the tax rates on your osCommerce website. The process will allow you to apply taxes for products on your website. First, you will have to log into your website as administrator. Click on the Locations/Taxes option from the main menu and then Tax Rates. You will be presented with a list of the available tax rates on your website. To create a new tax rate, you simply need to click on the New Tax Rate button. 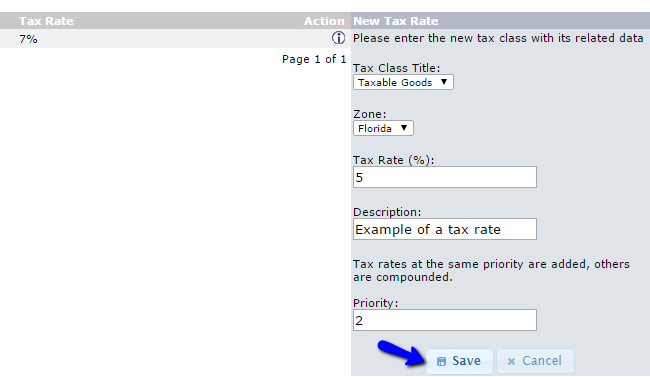 When ready, simply click on the Save button to create the new tax rate on your website. You can create new tax classes and tax zones the same way. Access your website's administrative area and navigate to Locations/Taxes > Tax Classes/Tax Zones. You also have the ability to manage the existing tax rate on your website. Simply access the same list again and select the existing tax rate that you wish to manage. You can then click on the Edit or Delete button on it’s rate.